I almost put this under fashion, but it's technology? So I put it in here in the end. 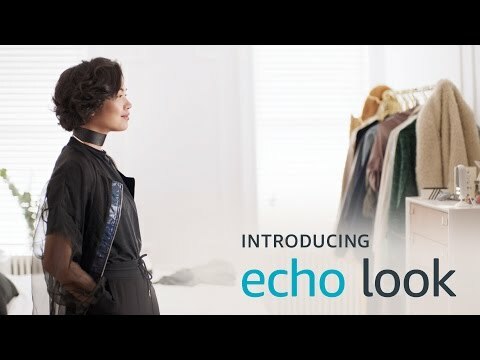 In case you're anti-video (which I usually am) this is a commercial for Amazon's newest toy, the Echo Look. It's a hands-free assistant that will take photos and short videos of you so you can see your full-length look hands-free and with lighting that get sent to your phone. It comes with a service called StyleCheck where you can upload your various outfits and get feedback both from computer algorithms and stylists. Plus it's just like an ordinary Echo and you can ask her the weather, timers and alarms, traffic updates, to look things up, to control your smart home devices, etc etc. If this weren't $199 I would SOO get it, but I'm a nutcase. So do you guys think this is fun too, or am I just totally a sucker for all things tech??? I wouldn't because I can't bear to see myself full length *but* as someone who coveted Cher's wardrobe organiser on Clueless, I can see the appeal. I'm a bit weirded out by technology that provides others with easier access into our private lives (especially with the current regime voting to reduce internet protections), so it's a big NO for me. I got rid of my Pet Cube (camera to check in on pets remotely) for the same reason. Plus, I refuse to ever take a selfie, so there's that. I IMMEDIATELY thought of that when I saw this video! @nolakent - I feel you on the invasion of privacy thing. It is something that worries me, but I love my Amazon Echo so much that I guess I'm kind of willing to risk it? I don't know if I'll get the Look (I sure can't afford it for now), but I'm giving up my Echo over my cold, dead body. Also I think those pet cube things are totally cute. I might get one, if I could put it somewhere that some hacker couldn't see anything valuable or the entrances/exits from it. I don't think it's the unwashed masses so much as a group of stylists and a computer doing the StyleCheck thing. But I could be wrong! I wouldn't get one, but that's because I prefer to cling to my mental picture of myself. Same. Also, my wardrobe is pretty much all basic mix and match stuff, so none of it is really all that bad. And I'm not all that into fashion for myself. Without my mom's influence I'd just wear jeans and freebie racing shirts every day. I'm in my 60's, retired, so my wardrobe is pretty basic-jeans, some better casual pants and so tops that I can dress up with accessories for the occasional evening out. I have taken maybe 4 or 5 selfies, one of which was downright scary. Most of the selfies I've taken are of me with my mom and/or dad, and that's only because I have long arms so I can hold the phone far enough away to get all 2 or 3 of us. My mom is way more into selfies than I am. I did take one really good one on the Golden Gate Bridge that I used as my profile photo on Facebook for a really long time. I have a bunch of selfies and zero group selfies because I have no friends. But that's ok. I have the Bitter Kittens, and chocolate. What more do you really need? And my group selfies are just me and my parents and only ever at my mom's insistence. My BFF lives 3,000 miles away from me so when we are together we're too busy catching up to bother with taking photos. And I don't really need anything else - just a job that pays a decent wage and maybe a couple weeks of vacation time! I feel about this very much like I feel about services like Blue Apron -- no desire to use it myself, but I'm glad it exists for those who want it. I like to think I'm good at dressing my body (or planning my meals) and having a strong personal style. On the other hand, one of my close girlfriends doesn't feel nearly as comfortable with fashion and feels like she doesn't always know what looks good on her, so maybe she would love something like this. Interestingly, I was listening to 'Wait Wait a Don't Tell Me' and one of the panelists thought this might be helpful for him as he has color blindness. I wonder what sort of algorithms are used for the non-human component since personal style is subjective. I know some silhouettes/cuts/colors are more flattering but aren't always the things I feel best in. I know some silhouettes/cuts/colors are more flattering but aren't always the things I feel best in.